To conserve Arizona’s diverse wildlife resources and manage for safe, compatible outdoor recreation opportunities for current and future. The Arizona Game and Fish Department offers paid summer internship opportunities in cooperation with participating college and universities. This is an excellent opportunity for students interested in gaining hands on practical work experience while working with a diverse group of professionals in the fields of wildlife science, biological science, wildlife management, and many other professions within the Department. Who is the Arizona Game and Fish Department? The Arizona Game and Fish Commission, whose five members are appointed by the governor, are responsible for establishing policies and rules for the management, preservation, and harvest of Arizona’s wildlife. The Arizona Game & Fish Department is responsible for managing Arizona’s fish and wildlife resource as an enduring public trust. In addition, the department is charged with promoting safe and responsible use of watercraft and off-highway vehicles. Funding is provided from the sale of licenses and permits; watercraft registration fees; federal excise taxes on firearms, fishing equipment, boats, and other sporting goods; state lottery revenues; donations on state income tax forms; and various contracts and grants. 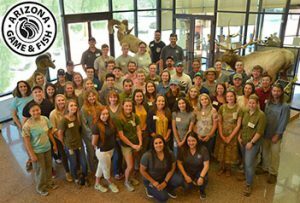 The Arizona Game and Fish Department offers paid summer internship opportunities to current students, graduate and undergraduate. This is an excellent opportunity for students interested in gaining hands on practical work experience while working with a diverse group of professionals in the fields of wildlife science, biological science, wildlife management, and many other professions within the Department. The Arizona Game and Fish Department is seeking students to work during the summer to perform duties in the area of wildlife management. Students will perform duties under close supervision. 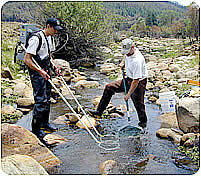 Duties may include: collecting data, tracking, monitoring and counting animals, computer entry, developing educational materials, conducting creel surveys, fish sampling, habitat measurement, fish stocking, hiking, camping, swimming or working varied hours. Fieldwork may involve long days outdoors in extreme temperatures. Student interns are hired on a temporary basis and paid an hourly rate of $11.00 or $12.00 for returning interns. Interns are not benefit eligible and work at the discretion of the appointing authority. Interns may be employed through their approved assignment or the department determines that the work is no longer required. Assignments are typically full-time (unless indicated by hiring supervisor) and generally last between 8 to 12 weeks. Cover Letter – Optional – can list internship preference order, listed by the hiring supervisor name. Students may identify up to three internships that they have the most interest in. Resume – Must include: 1.) contact information, 2.) Current GPA/education information, 3.) work/volunteer experience, if applicable, to include title, dates, and summary of job duties/responsibilities, and 4.) at least three professional references. Transcripts – An unofficial is copy of your school transcripts is required. The transcript shall include the student’s full name, name of school, current GPA, and degree program. An official transcript may be required prior to appointment. Applications must be submitted through the site no later than close date. The anticipated start date for a majority of the internships is May 20, 2019. This is just a small sample of the many diverse internship projects available!